Q: My son is concerned that the 'pumicebag' walls won't be strong enough to support a flat concrete roof which, in turn, won't be able to support the weight of floor tiles and people sitting up there. Kelly, I am now incredibly worried and implore you PLEASE, to give us a second opinion on this important point before we start building. A: If you carefully tamp the bags into place as you lay them and make the reinforced concrete ring beam at the top of the walls, you should have no problem from subsequent settling. Bags of pumice, especially once they are plastered are plenty strong enough to support your roof structure. Q: Starting next summer, my family and I will be building a below-grade earthbag structure, made of several connected domes in the north, where it is very cold in the winters. I was curious if we needed to plaster it, given that it will just be backfilled anyway, or if we could just superbly waterproof it (6 mil poly sheeting). Did you plaster the side you bermed? Any idea how many feet of earth we can safely put on it? 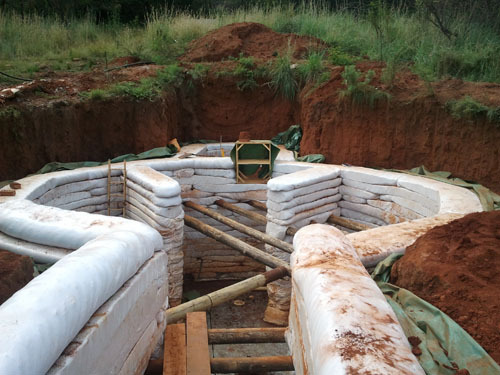 A: I see no need to plaster earthbags before backfilling, but the poly sheeting is definitely a good idea; I actually used two layers of plastic over my backfilled earthbags. As for how much weight can be placed on an earthbag dome, you would be exploring somewhat uncharted waters here, so I caution you to be very careful. I did cover my underground dome pantry with about six inches of earth and heavy gravel, and it held up fine. It is kind of tricky, because the steeper the dome is, the stronger it will be to withstand downward pressures, but also the steeper it is the harder it is to get soil to stay on top of it. I ended up with about a 45 degree earthbag roof on my pantry which was reinforced underneath with the pole rafters bolted into a ring at the top. You might consider some sort of an arrangement like this ..and also talk to an understanding engineer...or at least do some experiments before committing to an entire house like this. Q: On a rectangular earthbag wall I would like to have a tiled roof. How to do that (with long eaves)? A: The roof structure on a house with vertical walls is likely to be the same as a conventional house, with trusses, rafters, or SIP's...and yes, long eaves is a good idea. Q: We would very much like to have our house design incorporate a basement, to take advantage of the temperature differential and also to gain the greatest possible space for the least use of materials. Are earthbag walls suitable for basements, perhaps if wrapped on the outside with a 6mil polyethylene or something similar? 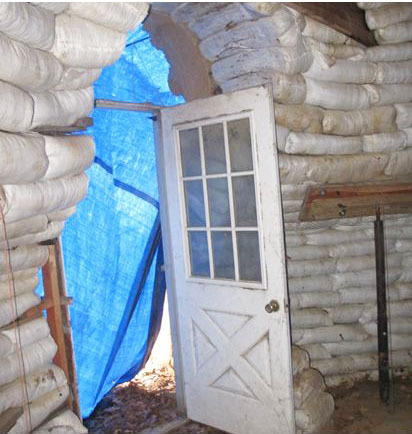 A: I think that earthbags are especially well-suited for below-grade walls. The earthbag house I built in Colorado was substantially bermed into a hillside, and I just used two layers of 6 mil polyethylene as a moisture barrier before backfilling. Obviously the walls need to be sufficiently curved or buttressed against the lateral pressure from the earth. Q: I really liked the little dome house in Mother Earth News Magazine. I want to build these little houses for my mini goats...they would just love them especially the grass roofs to graze on. Would these little houses be able to support goats walking on the roof without collapsing? A: (Owen) Domes are the strongest shape in nature. There's already many tons of soil on top and many more tons could be added with no damage. So there's little worry about a dome like this collapsing from animals walking on it. There's a much greater risk of damage from their hooves puncturing the plastic. This is what you need to be concerned about. The soil on top is very thin -- just a few inches. The steep slope makes it difficult to keep soil on top. Rain keeps washing it downhill. For this reason I do not recommend building these domes for goats as you describe. Unless you can figure out a way to add lots of soil on top and keep it up there, the plastic will be close to the surface and vulnerable to punctures. Q: In my opinion, there is a contradiction between this : "Super Adobe homes are strong, and can be wind and waterproof. Designed to be resistant against extreme environments, they have been earthquake tested to 6.5 on the Richter scale, complying with the most rigorous earthquake building codes." A: As with everything , there a lot of opinions out there. The quote from the page about the Pegasus project are not my words; they stem from literature put forward by CalEarth, since Nader Khalili was the architect involved with that project. His assessment is based on the testing that was done in the 90's on a small dome, as part of the process of permitting a larger project for the City of Hesperia near CalEarth. While I agree that the results of this testing are impressive, and that domes of this configuration do seem to be extremely durable, I know at least one engineer who questions the validity of these tests. Furthermore this testing was only for a small dome, not any vertical-walled structure, so one can't necessarily extrapolate that all earthbag building would be equally durable...there are just too many variables. Therefore I do stand by my statement that you quote above. I would hate to advocate something that is eventually proven to be inadequate; the consequences are too risky. Q: I am halfway with my shelter (underground) out of earthbags, and have a question …Let me give you background first. Round building, inside diameter is 7meters and we are doing a double level (ground and mezzanine floor), so the roof will be about 4.3meters high. My bags are 70cm or 28inches wide – that is rammed and squared up. I want to put a concrete slab on top of the whole thing, and thinking about a 12 inch thick slab. Now, to do that I will need a pillar in the middle of my room, and this is where the questions start. 1. 12 inch slab – is that wise? Are there alternatives, because I want to cover it with some dirt on top of the roof so that it looks bermed. 2. How thick a pillar? Can I build it with earthbags or shall I go concrete (not that I want to). I thought of building a square hollow pillar out of bricks and then reinforce the inside and fill it up with concrete – will that do, or alternatively instead of concrete to ram earth inside the brick hollow? A: (Nabil Taha, Engineer) How high the dirt will be above the slab? The slab must be reinforced with steel bars to support the load. The slab must be tied to the walls at the end to it does not slide due to seismic loads. The column at the middle must have a big enough foundation to support this heavy load. The earthbag walls must be reinforced to support the weight of the slab, weight of the dirt and the seismic forces. The above are big questions and can only be answered by structural analysis and structural design. You need to hire a structural engineer to do the structural design for you. A concrete slab takes MONTHS to cure, is expensive and takes a lot of preparation work, not so environment friendly etc., so I am looking at alternatives, like wooden poles over the entire shelter with a cross layer under that for support every 3ft. First, lay the support beams every 3ft, to ensure that they can support and hold the cover. Then, over the entire roof with poles of about 8-10 inches thick as close to each other as possible, then a layer of damp proofing over the poles, and then a 2 inch thick layer of earth bags. Over that another layer of damp proof, and only then the dirt. (Kelly) Looking at your photo, it appears that you have a pretty hefty structure going there. I would certainly have no worries about the walls of the circular section being self-supporting. The straight entry section is somewhat more questionable as to its ability to withhold the lateral pressure of the backfill. If there is enough vertical reinforcement in the walls that is also connected to horizontal beams, you might be OK.
As for the ability of your roof concept to hold up all of the intended weight, it is a bit hard to tell. I would expect that the entry portion would be OK, but the spans of the circular part are greater. I would feel better about the sturdiness of this if you also had the poles that will be close together and next to each other extend into the the bag wall for support, rather than depend entirely on the lower beams. Another unknown is just how strong those poles actually are. You can't tell from a photo if they might have a weakness somewhere which could compromise the whole system. So those are my thoughts...but I am not an engineer! Q: Mick owns a timber frame company in Michigan where for the past 30 plus years he has cut, sawed and created timber frame packages sold all over the world. He, like myself, loves the potential of earthbag. Mick was saying it would be cool to develop this Gaia House using a combo of timber frame and earthbag. Could that work? A: Sure, you can easily combine timber frame with earthbags as infill, and there would be some advantages to this. You could erect a roof over the project quickly to make the work flow well over a longer season. Also, this might make it possible to use some lightweight, insulating fill, such as rice hulls, that tend to compress some. Another advantage is that building codes are more easily accommodated. Q: How critical is the top ring beam? There are no earthquakes here but there are some small tornadoes every 7-10 years. Current technology using cement block doesn't use a ring beam. If I use rope fasteners starting 4-5 layers down would that suffice? A: The ring or bond beam serves to help rigidify the structure as well as protect against earthquakes or winds. I would recommend using them, with some vertical steel rods sunk into the walls near the doors and windows. Allow the rods to be embedded in the concrete bond beam. I know this adds to the expense and time of building, but I think it is cheap insurance. Q: I'm planning to build an earth bag house set against/dug into a hillside. The height will be around four-five metres (13-16 feet). In my cautious way I plan to make the front wall 70cm thick at the base, tapering up. But the back wall is supported because it leans against the cut in the hillside, so it doesn't really need to be so thick. Is there a tested way to vary wall thickness at the same height? I.e., to have the base of the front wall 70cm thick but the base of the back wall 45cm thick? We have 45cm and 35cm tubes. Because we're working with tubes the ideal is to have the tube go the whole way round, but obviously this would make it hard to vary thickness. A: The rule of thumb about the thickness of earthen walls relative to their height is that they should be at least 1/10th as thick as they are high. So your 5 meter wall shouldÂ be at least .5m at the base, which your plan would come close to providing. This rule is partly for stability, but it is also for load bearing support, so it would apply on both the front and the back of your house. I suggest sticking with uniform thickness of bags all the way around, and reduce the size when you get to an appropriate height. Q: After viewing the simplicity and ethical way of construction this seems to be a viable way of adding and enhancing an older mobile home with the final product being the mobile walls and ceilings eliminated. A: As for using earthbags to retrofit an older mobile home, this does seem viable, although I would likely consider covering the walls from the outside, and retaining the interior finishes. Otherwise you might not end up with much space inside. Q: We would like to build in such a way that our structure is somewhat modular/expandable ... this seems more efficient to us. Aside from planning things like door and window locations with future expansion in mind, I'm wondering if there are any other things that need to be considered. In particular, I'm concerned about how one would tie a new wall into the existing structure to make it a monolithic whole. A: Making additions to an existing earthbag structure this can be done, but it is generally best to plan for this in advance by creating a doorway for the eventual passage first, and just filling it in with temporary bags, so that it is easy to push through later without needing to tear into bags and wire. A new wall could be tied to an existing wall with rebar pins if necessary. It is the rebar pins (or whatnot) that worry me, as it seemed to me that the seam between the old wall and the new (where there could not be a running bond) would be a critical weak point. One method I thought of would be to make a one bag buttress where I knew the new wall would go, with half bags in every other layer. Later on, I could strip off the plaster, knock out the half bags, and wedge new bags in (filling them in place I guess). That seems awkward, though. Using rebar, how would the pins be oriented? Just rammed diagonally through the bags of the new wall into the old? Your buttress idea is a good one, if you can work this into your plan. Rebar pins diagonally is what I pictured; this would not be as strong as interlaced bags, but if it were done on every course it would be pretty secure. Another thing you could do is connect the two walls with wire mesh on both sides that wraps both walls before plastering. Q: I have a small rock cabin in Spain that we want to enlarge using earthbags. Is it possible to raise the roof by adding earthbags on top of the existing rock walls? (The width is almost exactly the same as a 25k polypropylene bag.) If we want to build an addition to the rock cabin what do we need to do to make sure the earthbag wall doesn´t separate from the rock wall? A: I see no reason why you couldn't extend your rock wall with earthbags. To connect an earthbag addition to the existing stone structure I would suggest that you create a strong physical bond with a series of anchors embedded in the stone wall that are also embedded in the earthbag wall. This could be done with pieces of steel bar that is pounded into holes drilled in the mortar line between the stones in several places. Q: My wife and I bought a few secluded acres in the country with a small 2 bdrm mobile home on it. We had always planned to build on the property and give the mobile home to someone else, but the economy has changed that plan. Plan B now is to add onto the mobile home to make room for our newborn son. With all the research I have done it seems earthbag or cob would be best/affordable. I would like to almost double our home size with the addition. My first question is how would we safely tie the earthbag addition into the mobile home exterior/walls? A: There are several ways to make a positive connection between earthbags and the existing walls. One way is to make steel or wooden connector plates that go between two courses of bags at perhaps 16" intervals which are spiked with nails that dig into the bags and are also screwed (or otherwise attached) to the existing wall. Should I put roof up first and build up to it, or roof after? You can go either way. You could make a post and beam structure that supports the roof first, and then do cob or earthbags as infill. Or you could build up the new walls to their proper height and then attach the roof to it, probably making a bond beam at the top of the wall to help make the transition. Both of the above approaches can create very strong roof/wall connections, if done properly. Q: How does one attach, or tie into an existing structure? A: You can generally interconnect earthbag structures with both rebar pins and with mesh that wraps into both structures. Q: I have begun working on an earthbag project on a farm here in Southern Illinois. The primary worker on this project, Eric, recently lost his leg in a motorcycle accident. However, the project will be finished. The owner of the farm is in favor of tearing it down to a one story structure whereas Eric would have the walls thickened doubly to reinforce the weak area. I would really appreciate your opinion on this point! A: The way the structure is now looks dangerous to me, so obviously something needs to be done. I don't think that removing the second story will solve the structural problems. It does seem possible to me that doubling the bag wall on the first floor up to nearly the door height might reinforce the wall to make it safe in there.